"I was looking for information about C-119s in Ethiopian Air Force and found your propliner website. Do you know how many of these aircraft were sent to Ethiopia, or was that USAF 7844 the only one? Also, if you know where to find more pictures of that desert camo I would like to know. 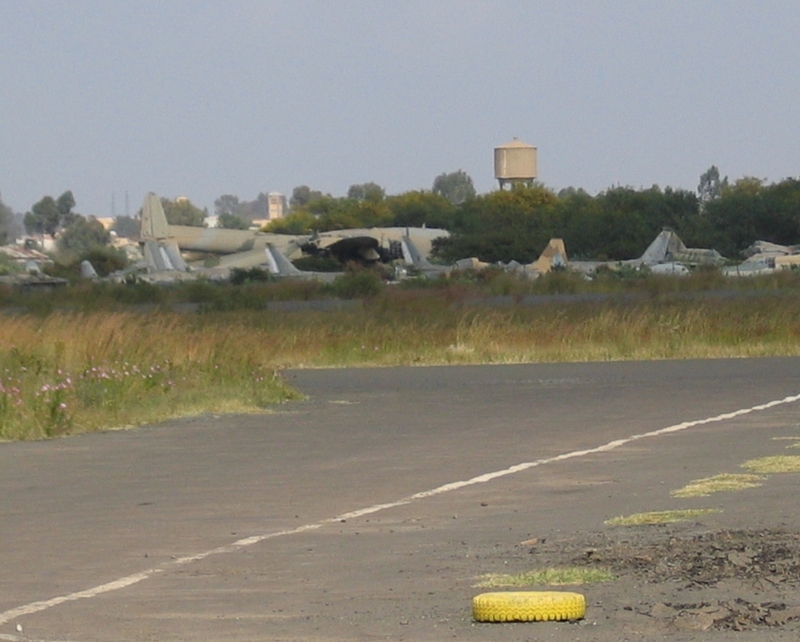 Today, there is one ex-Ethiopian AF Boxcar laying in the outskirts of Asmara Int'l Airport in Eritrea. Aircraft is in very bad condition, starport boom has collapsed etc, but at least it still exists. The photo on the left was taken on 29Sep03 and on the right 05Nov03. The situation was seen unchanged during Jun04." 911, 912, 915, 916, 917 as in storage by Apr96; and 918 as derelict (no date). 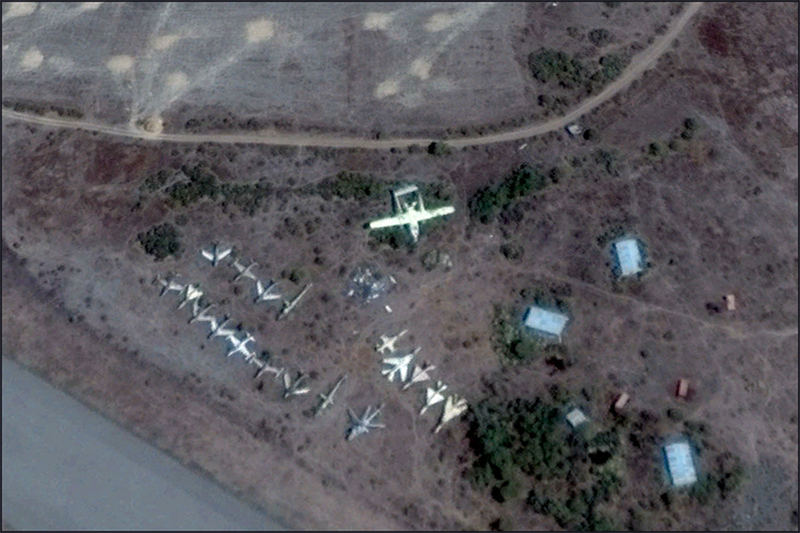 The photos on your site appear to show a couple of MiG-23s as well. Fairchild C-119K Flying Boxcar: 918 & 919 were former the Belgian C-119Gs CP-29 and CP-37. Whether they wore 918 and 919 needs confirmation. So 910 looks like a safe bet!" As a note: T-33A 252, 264 and 270 have also been reported as F-86A and in fact are in the F-86 serial range (-Stig). Back in 1993 I was on an Ethiopian Airlines 767 to Addis which stopped; I cannot recall if it is/was the only one present, probably. In june 2017 (some 12 years after I started this page! ), Michael Menard wrote me: "I have found a Google map image that may be of interest to you. These are two screen-capture images from my computer. 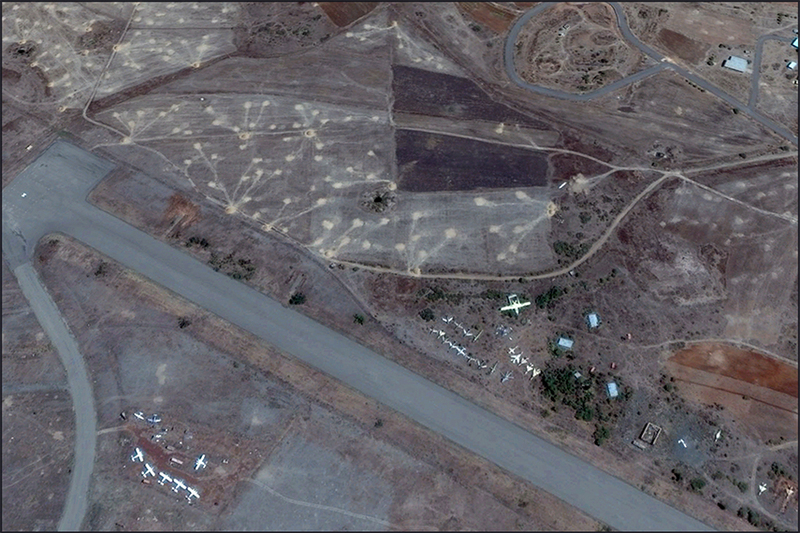 I was just panning around and saw what looked to be abandoned planes parked near the Eritrea Asmara airport. One of the planes appeared interesting to me, so I did a search on twin boomed aircraft and the Fairchild Boxcar popped up - along with your website! Is this the C-119K that you mention on your website? It looks like a twin engine cargo plane of some sort with the back doors open." Eric Taylor sent me these photos, taken in June 2006 in Asmara, Eritrea. This is C-47A ET-AJH (c/n 19283). 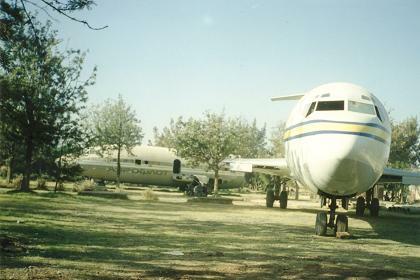 The 1984 edition of the Douglas DC-3 and its Predecessors (by Air-Britain) offers the following brief history: "Delivered to the USAAF in Dec.1943 registered 42-100820 and for a period after its delivery the documentation was lost, but it ended up in Iran with the Imperial Ïranian Air Force (numbered 5-10) in Jan.1957." 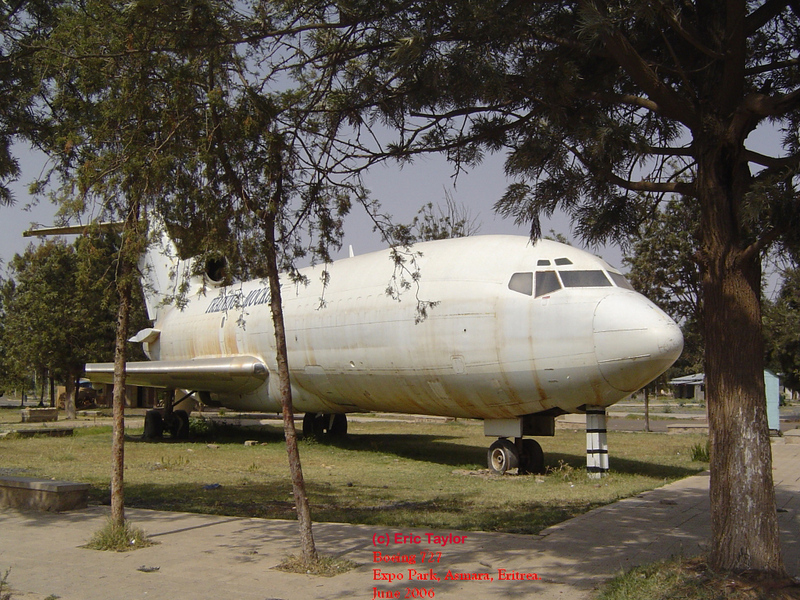 In Air-Britain's follow up edition ("update 2") one can learn that this transport was registered 711 for the Ethiopian Air Force (but no date of transfer) and the fact that it was registered ET-AJH for RRC Air Service on 30Sep87. So how did it get here ? And when ? Eric wrote: "The hulk of the aircraft has been moved to the "Expo Park" in southern Asmara, where I took the attached photo in June 2006." Eric also added: "There is also an ex-Aeroflot An-12, a Boeing 727 ("Training Mockup"? Read more below) and a Canadian Hughes 500C helicopter at the same site. 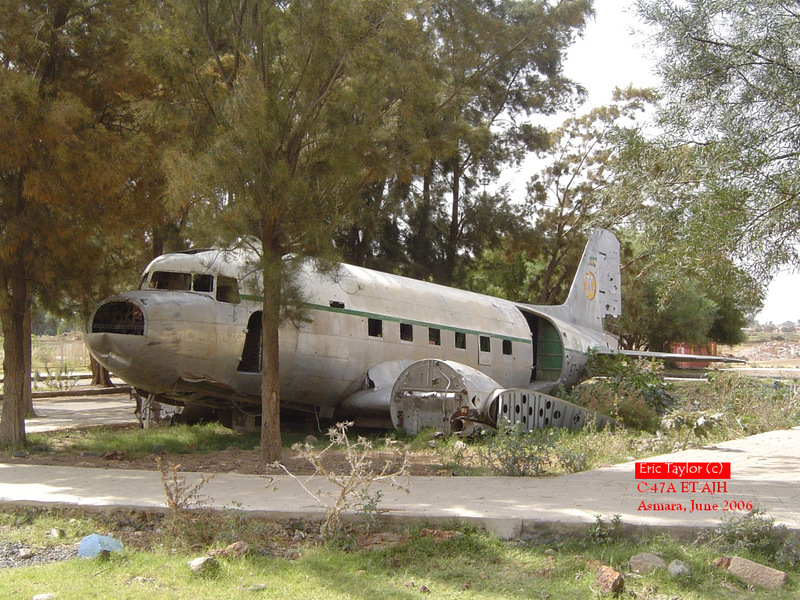 Lastly there is another ex-Aeroflot AN-12 located at the bus station in Massawa, on the Red Sea coast. " Eric later added the following info on the 727: "It's an ex-Aero Zambia Boeing 727-25F, 5Y-BMW (c/n 18255/14) and has quite an interesting history! 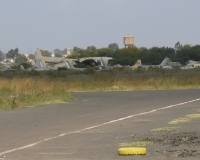 The aircraft was in Asmara delivering "relief supplies" to the Eritrean government when its left hand wing was damaged by a fuel truck in late May 1998. 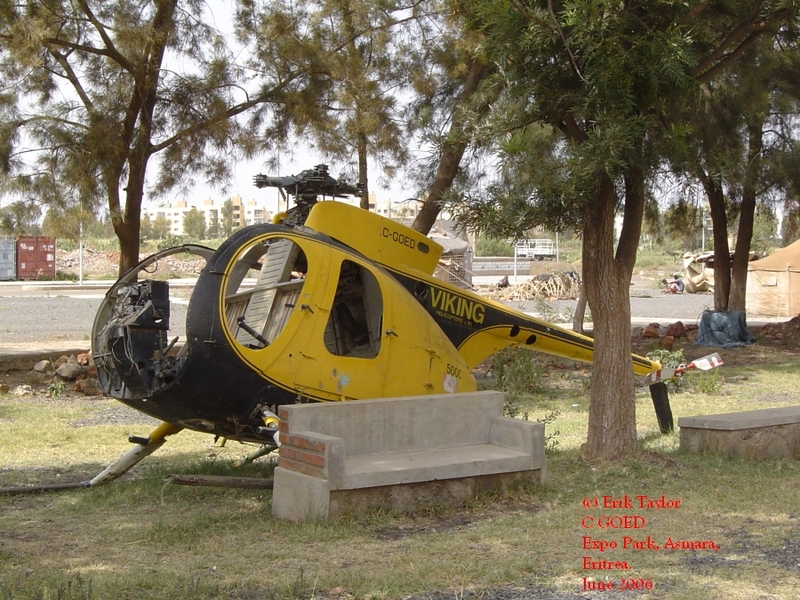 While awaiting repair and some spares to be brought in, the airplane was strafed by an Ethiopian MiG fighter on 5th June 1998 and damaged by small calibre gun fire. Wiring damage behind the cockpit was of such nature that the whole area needed to be re-wired. It was decided not to repair the plane. The Boeing was purchased by International Air Parts and was stripped of its engines and other parts. The Eritreans proceeded to cut off the wings and tow it for three kilometres down the main airport road to the Expo site, where it now sits, having been repainted all white." 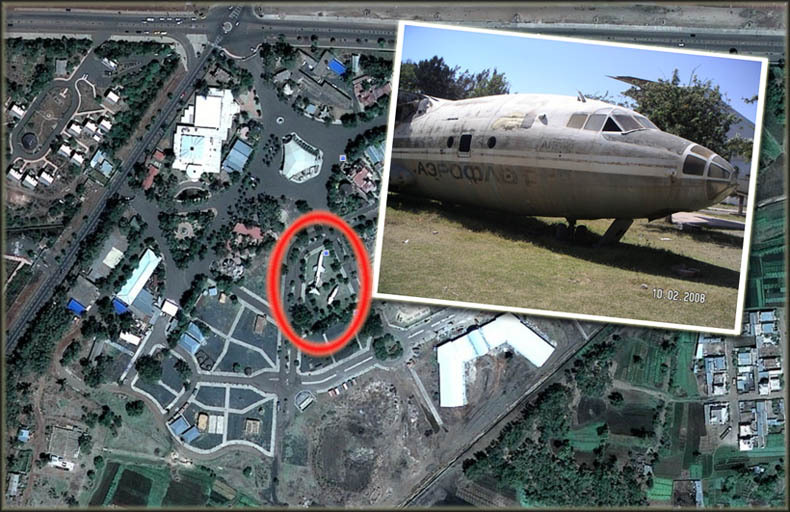 "Just happened to stumble upon this webpage, concerning a some-what castrated hull of AN-12 CUB now on display at the recreational park grounds in the Southern suburbs of Asmara, Eritrea. Part of my history: in 1986 I was serving with the Soviet Military Advisers team and in August I had got new assignment to Asmara. Once I was accompanying our Commanding General on his visit to the Asmara AF Base. There at the outskirts of the field we saw a damaged Soviet AN-12. 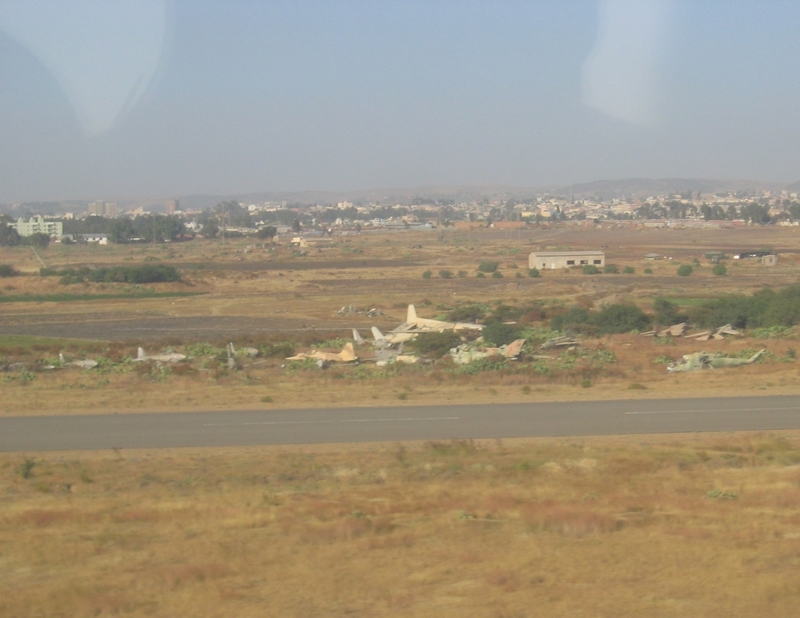 The plane had been hit by a couple of small fragments of shrapnel produced by explosion of some EPLF rocket. It was an interesting case � one of those splinters penetrated forward starboard section skin hitting oxygen equipment package located on rear bulkhead of the pressurized passengers� cabin (just aft of flight deck). Small punctures � critical damage: flight deck and pressurized cabin were burned-down. Relief squadron commander declared the aircraft beyond salvage and decided to cannibalize her. The plane had been gradually stripped of engines, avionics, landing gears, etc. when our General happened to pass by� Bang! Generals are prone to have sparks of genius: the plane would be converted into the make-shift Barracks for the enlisted personnel of the Soviet signal detachment at the Advisers� Group HQ (Kagnew Station)! The inventive moron would not be bothered by the fact that signal platoon troops had been already billeted in the rather comfortable rooms (in the former US Officers� Club house). General just had his whim! In the next few days AF technicians dismantled wings and horizontal stabilizer, then two Signals warrant-officers were dispatched to prepare the airframe for towing into the down-town. They simply hacked the tail section off (down to the loading ramp) using simple axe and a push-pull felling saw! The crippled hull then was towed to the rear fire gates of the Kagnew station (opening to Beirut street) and man-handled inside by combined efforts of the Soviet advisers team (the General would not leave the scene and was running around, adding to the confusion, shouting and directing privates and colonels alike � a big crowd of local bystanders quickly assembled, and Ethiopians were having BIG time, nearly laughing their heads off). After two hours of pulling, pushing and swearing aloud, the crippled An-12 was placed against the wall of the former Officers Club. 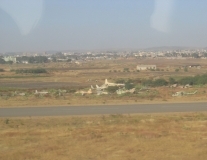 One thing should be kept in mind � Asmara lays at an altitude of approximately 2.500 meters ASL, if I�m not mistaken. Therefore it is rather cold at night � and our soldiers had to sleep in their winter field jackets and Army shapkas, sometimes even covering themselves with mattresses against cold and moisture mountain air... During day time, it was all different and African sun was heating the aircraft metal mercilessly and the night shift signal operators had to strip off even their underwear trying to get some sleep in extricating oven heat!